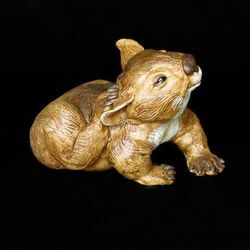 The lovable character of the wombat shines through in this cheeky poly-resin figurine. It is beautifully crafted and hand-painted and is an ideal gift for the discerning buyer looking for something just that little bit different. Wombats are true characters, full of mischief, are short and stumpy in stature, but don't be fooled, they can run up to 45 kilometres an hour! There closest relative is the koala. Both the koala and wombats pouches face backwards - opposite to the kangaroo pouch. 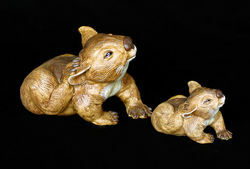 A smaller version of this wombat is also available as shown in the image but not included.